Santa Rosa has a rich seismic history, and the most exciting chapters may not have been written yet. In Santa Rosa, sixty miles to the north of San Francisco, and one of the most beautiful towns of California, practically every building was destroyed or badly damaged. The brick and stone business blocks, together with the public buildings, were thrown down. The Court House, Hall of Records, the Occidental and Santa Rosa Hotels, the Athenaeum Theatre, the new Masonic Temple, Odd Fellows’ Block, all the banks, everything went, and in all the city not one brick or stone building was left standing, except the California Northwestern Depot. Although this was the most severe earthquake in California’s recorded history, it was neither the first nor the last time that Santa Rosa suffered a hefty jolt. A list at the end of this article identifies thirteen major Santa Rosa earthquakes over a hundred-year period. So what’s in store? A consensus is emerging in the seismological community that the Hayward-Rodgers Creek-Calavaras fault system may present the greatest danger to the Bay Area. This system runs through some of the most populous areas of the Bay Area, and recent estimates indicate a 30% chance of a major rupture in the next 30 years. In a worst case scenario, a significant length of this fault system could “unzip” the way the San Andreas did in 1906, releasing a huge amount of energy. The Rodgers Creek fault bisects Santa Rosa, and passes under or very near to all major hospitals in the city. A major quake on this fault is likely to devastate downtown and incapacitate most city and county facilities. 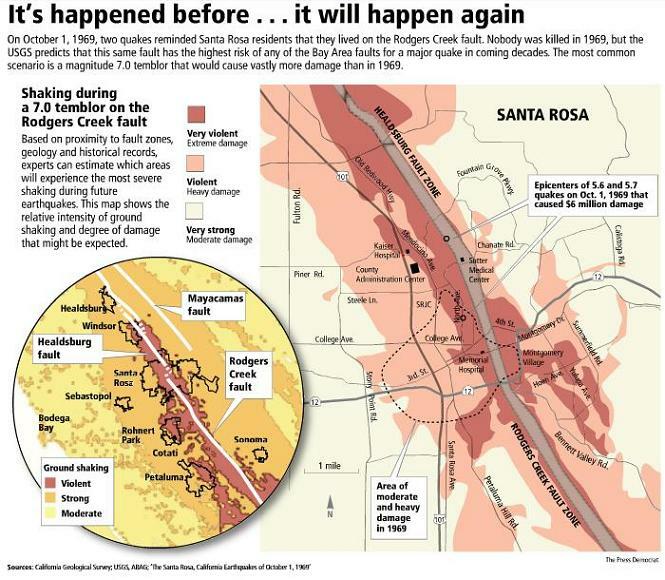 Whether it is Rodgers Creek, San Andreas, Loma Prieta or some other fault, sooner or later Santa Rosa will suffer the effects of a major earthquake. It is up to all of us to be prepared and to act intelligently when it happens. 1865 March 8, 6:00 a.m. Intensity VIII at Santa Rosa and upper Bennett Valley. Plaster cracked, clocks stopped, and chimneys thrown down. 1868 October 21, 7:53 a.m. The Hayward Earthquake. Maximum intensity X at Hayward. Surface breakage was observed on the Hayward fault from Warm Springs to San Leandro. The shock was perceptible over an area of roughly 100,000 square miles. At Santa Rosa, the earthquake was reported as the “severest shock yet felt.” Nearly all brick buildings in town were more or less injured. Many chimneys down. 1888 February 29, 2:50 p.m. Intensity VII at Petaluma, where walls cracked; VI at Santa Rosa, where the shock was violent and people ran out of houses. 1891 October 11, 10:28 p.m. Maximum intensity VIII to IX at Napa and at Sonoma, where people were shaken out of their beds, chimneys demolished, windows broken, and considerable damage to plaster occurred. At Santa Rosa, one observer reported the shock as the “severest in four years” (presumably a recollection of February 29, 1888); the oscillations lasted 45 seconds; slight trembling perceptible for 3 or 4 minutes. 1892 April 21, 9:43 a.m. Large aftershock of the foregoing. Maximum intensity IX at Winters. At Santa Rosa (VII) many brick buildings were cracked, more plaster damage occurred, two brick walls slightly bulged out, iron columns moved, and in some parts of town chimneys were wrecked. 1893 August 9, 1:15 a.m. Sonoma County, VII to VIII at Santa Rosa, where this was said to have been the most sever shock since 1868. Chimneys fell and windows were broken. The plaster in the courthouse was extensively damaged. 1898 March 30, 11:43 p.m. The Mare Island Earthquake (intensity VIII). At Santa Rosa, the vibrations lasted fully one and three-quarters minutes. Heavy plate glass windows in many business houses were broken; throughout the city plaster was shaken from walls and ceilings. 1899 October 12, 9:00 p.m. Maximum intensity VII to VIII at Santa Rosa, where plaster was knocked from walls and some chimneys fell. 1906 April 18, 5:12 a.m. Magnitude 8.3. One of the greatest shocks on record in California; caused by movement an the San Andreas fault from San Benito County to Humboldt County. Maximum fault offset was a 21-foot horizontal shift near the head of Tomales Bay. Extensive damage at San Francisco, Santa Rosa, San Jose, Sebastopol, and many other places. In the opinion of Townley and Allen, Santa Rosa, 20 miles from the San Andreas fault, sustained more damage, in proportion to its size, than any other city in the state. 1906 to 1968 Many smaller earthquakes felt in Santo Rosa, the strongest being in 1919, 1929, and 1956. With the possible exception of the earthquake at 2:39 p.m. February 25, 1919 (intensity VI), none was as severe as the earlier shocks in this tabulation. Seismic activity of interest to the residents of Santa Rosa was clearly at a much lower level throughout the 62 years following the major shock of April 18, 1906, than it had been in the 41 years preceding that event. 1968 April 25, 11:49 a.m. Magnitude 4.6. This earthquake, centered just north or northwest of Santa Rosa, damaged some chimneys, broke windows, and rotated or overturned a number of tombstones. Maximum intensity VIII, at Santa Rosa.